The intent of this plaza was to create an interpretive display that would tell the story of these champions. As a center piece we will help tell the story of Wausau’s first businesses, Barker-Stewart Mill, constructed on Barker Island by prominent lumber barons C.C. Stewart and Hiram Stewart. 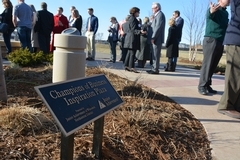 The Champions of Business Inspiration Plaza will become an excellent spot for showcasing Wausau’s economic vitality to relocating companies and prospective employees considering moving to the area as well as for current residents who can reminisce and reflect upon past business experiences with their children and grandchildren. Junior Achievement is a non-profit organization with strong community support that helps teach our area students about business and our economy as well as the value of entrepreneurship. Our Champions of Business program highlights the values, hard work and successful management strategies of our area’s most accomplished business leaders. To maintain a strong, historic perspective to this program, we only honor business leaders who no longer are involved in their business, but have clearly demonstrated a strong track record of economic success and community support. We encourage students and others in the community to visit our website (www.championsofbusiness.org) to find out more about these “champions” and the attractive Wausau area economic environment that has nurtured so many leaders and successful businesses in the past. Our goal is to inspire our young people to remain in or return to our area to start businesses of their own--or work for currently thriving businesses. Annually, Junior Achievement of Wisconsin, Inc. – Northcentral District reaches over 11,340 students in 572 classrooms. About Junior Achievement of Wisconsin, Inc. Junior Achievement is the world's largest organization dedicated to inspiring and preparing young people to succeed in a global economy. Through a dedicated volunteer network, JA Worldwide provides in-school and after-school programs for students which focus on three key content areas: work readiness, entrepreneurship, and financial literacy. Today, 138 individual area operations reach more than four million students in the United States, with an additional 4.3 million students served by operations in 114 other countries worldwide. For more information, visit www.ja.org.